For some inexplicable reason, it seems that most of the articles I read dealing with antenna and feedline efficiencies do not address the receive side of the equation. Yes, transmit power is expensive and there is a legitimate reason to reduce losses when converting power amplifier output to in-the-air power, especially for DX operations. However, it doesn't do much good to launch the full permissible 1,500 watts PEP and make a contact on the other side of the world if your system cannot receive a reply because of the excessive line loss and/or mismatch loss between your antenna and your receiver. 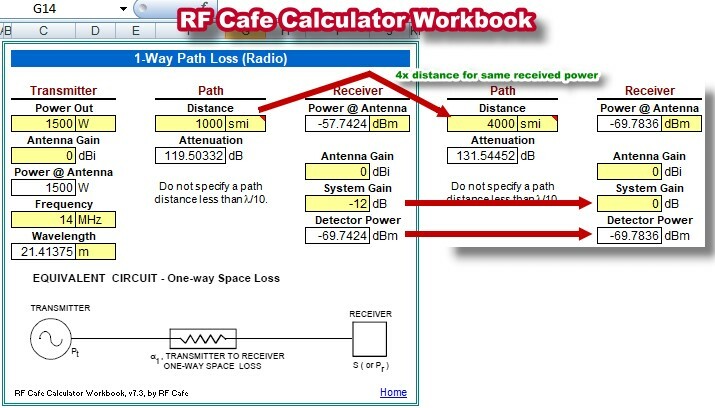 Antennas and feedlines are reciprocal elements so if you allow, say, 12 dB net loss there and compensate with additional transmitter output power, you also lose 12 dB of receive signal power in the other direction. RF energy attenuates at a rate of 6 dB for every doubling of distance, so that 12 dB loss cuts your minimum discernable signal to a source 1/4 the distance compared to a 0 dB net loss. 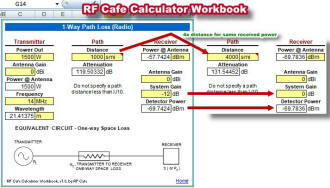 You can find RF path loss calculators online, or download my RF Cafe Calculator Workbook (MS Excel spreadsheet) and use its "1-Way Path Loss" worksheet. The image above demonstrates the concept using 14 MHz on the 20-meter Ham band - a popular band for DX work. 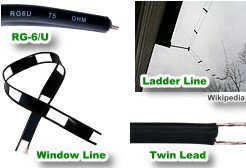 I use window line in my example because it typically has much lower loss than coaxial cable. At 14 MHz, 450 Ω ladder line has a loss of around 0.1 dB per 100 feet, 300 Ω twin lead is about 0.4 dB per 100 feet, and 75 Ω RG-6/U coaxial cable has roughly 1 dB per 100 feet. That's a 10x attenuation factor between ladder line and RG-6/U. Increase your frequency to 144 MHz (2-meter band), and the attenuation factors increase by 4 or more. Coaxial is very convenient to use because its containment of the RF energy within the outer shield makes installation a breeze since routing can be made with reckless abandon (or nearly so). Twin lead and ladder/window line requires more care in routing to avoid the effects of nearby structures. Sometimes coax is the only reasonable choice, but if your goal is to pull in the weakest of stations (due to remote transmit power and/or poor atmospheric conditions), then the lowest loss feedline must be considered. Hopefully, authors will begin including the receive signal strength in their articles when discussing optimization techniques and rationale.